Heading up to Mcafee Knob on the first day of the trip. 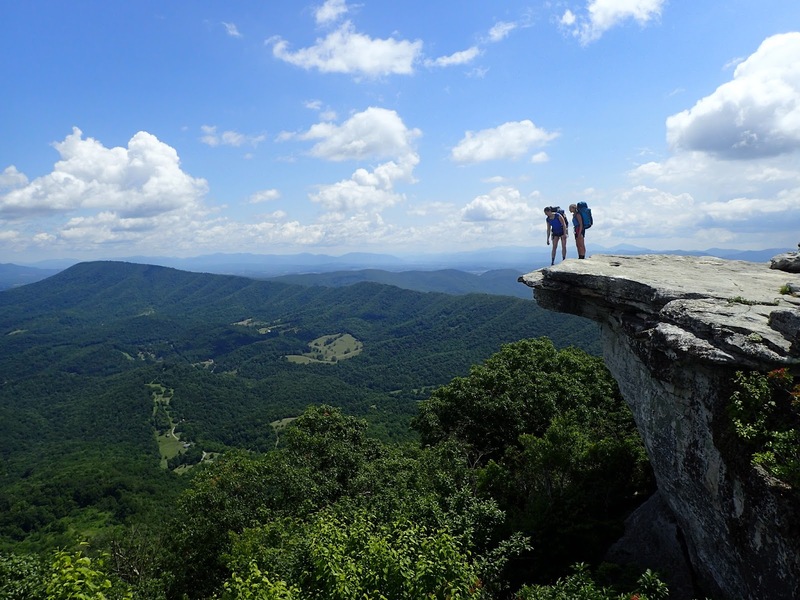 The Virginia Triple Crown includes three of the state's coolest hiking destinations - Mcafee Knob, Tinker Cliffs, and Dragon's Tooth. 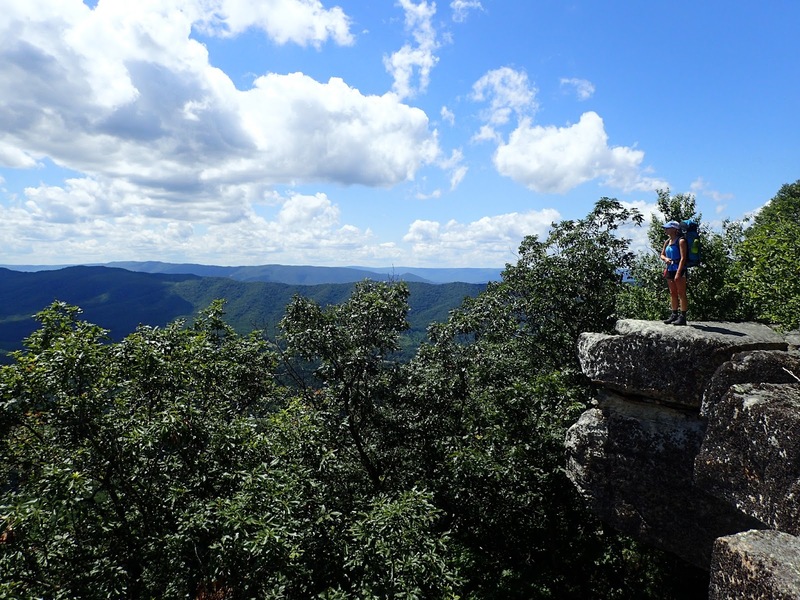 All are popular day hikes, and conveniently, they're located in close proximity to each other on or near the Appalachian Trail (AT). If you're willing to spend a night or two on the trail, backpacking to all three of them is possible via a handful of route options. 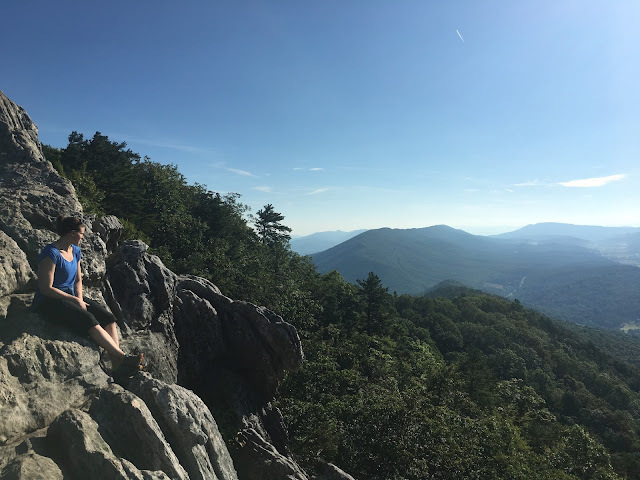 As part of a trip sponsored by Virginia Tourism for Great Outdoors Month, a friend and I made the drive down to the Roanoke area from Philadelphia to see how spectacular Virginia can be. We planned a three day, two night loop that got us to Mcafee Knob and Tinker Cliffs on the first day, covered a whopping 16 miles on the second day, and ended with a trip to Dragon's Tooth on the last day. After overnighting in Roanoke and dealing with some unexpected car trouble first thing in the morning (thanks Meineke #880! ), we arrived at the Mcafee Knob parking lot around 9:00am to start our hike. The parking lot was full, but luckily, we found a car pulling out just as we arrived. The first part of our hike took take us to Mcafee Knob, one of the most popular and most photographed trail destinations in the state. We crossed VA311, found the white blazed AT, and started heading up. 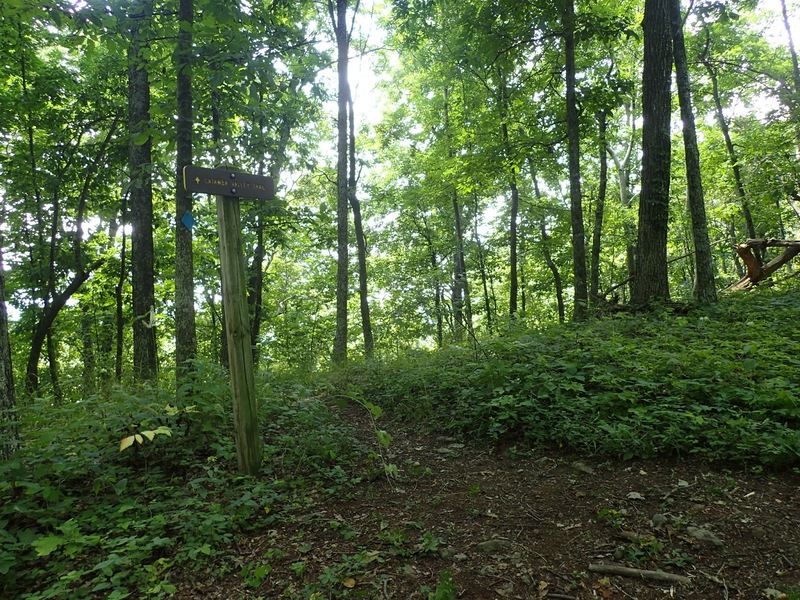 Hikers gain 1,700' in 4.4 miles to get to the Knob, passing the Johns Spring Shelter less than one mile in, and the Catawba Mountain Shelter 1.5 miles in. We crossed an old fire road, continued up, and found signs for an overlook and Mcafee Knob that were impossible to miss. My hiking partner and I checking out the view from Mcafee Knob. We rotated for photos with other hikers, it was crowded up there! The 270º view of Catawba Valley, North Mountain, and the ridge we'd take to Tinker Cliffs was everything we'd hoped for. After 45 minutes of photos, snacking, and chugging water to offset how much we were sweating, we picked up the AT and continued on. The AT descends nearly 900' after Mcafee Knob, and we'd re-gain that elevation en route to Tinker Cliffs. 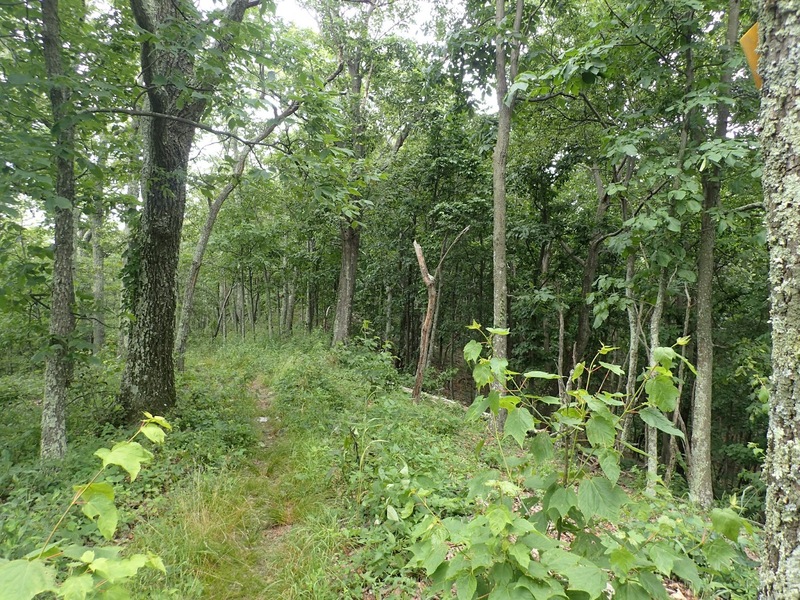 The trail wound through dense trees, which protected us from the hot sun. It took us two and a half hours to get to Tinker Cliffs, with stops for snacks, and save another hiker taking a nap in the sun, we had the Cliffs to ourselves when we arrived. We didn't stay long, knowing we needed to get to a reliable water source. The trail dropped downhill again, bringing us to Scorched Earth Gap and the intersection with the Andy Layne Trail. We stayed on the AT, dropping further down to Lamberts Meadow Shelter where we'd spend the night. My hiking partner taking in the view at Tinker Cliffs with North Mountain in the background. There were a handful of others already set up along the creek below the shelter when we arrived, and more came as the evening progressed. By the time night fell, we were sharing camp with 12 other backpackers and a dog. And it was a good thing; midway through dinner, we heard reports from one of the couples staying by the creek that a black bear walked past their camp 50 yards up the bank of the creek behind them. We all took extra care to store food and other scented items in the bear locker by the lean-to, and dispose of dirty dishwater properly after that! We woke, packed up, and started retracing our steps 0.7 miles back up the AT to Scorched Earth Gap by 9am. There, we picked up the Andy Layne Trail, dropping 1,300' down toward Catawba Creek and SR 779. The trail is on private land, so we made sure to stay on the path. It was a steep descent covering multiple switchbacks, and when we came to Catawba Creek, we chugged a liter of water and refilled our bottles. We'd be without water sources for the remaining 13 miles of our day. We continued past that branch of Catawba Creek, crossed through a cow pasture, side stepped cow patties, and crossed another branch. The second branch isn't a recommended water source, given it's close proximity to the pasture. The Andy Layne Trail ends at Rte 779 in a small parking lot. After crossing the road, we hiked into Jefferson National Forest and picked up the blue blazed Catawba Valley Trail after checking a map at a kiosk to confirm mileage for the rest of the day. The Catawba Valley Trail and North Mountain Trail looked like this almost the entire 9 miles. It would be a 2.5 mile steep, unrelenting climb up the Catawba Valley Trail to the North Mountain Trail, and another 9 miles of rolling ascents and descents before we reached our destination for the day. It was one of the longer, tougher days of backpacking I've done. The North Mountain Trail is overgrown, insects were plentiful, and just as we thought we'd finished the elevation gain and loss for the day, we'd see another hill ahead. But we had to complete this section; there are no water sources on North Mountain, and our plan didn't involve carrying enough to camp up there. Luckily, small side trails off the back side of North Mountain helped us break up the 9-mile section into mentally manageable chunks, and before I knew it, I could hear the sound of traffic along Route 311. We dropped down out of the trees, walked north on Route 311 to the Dragon's Tooth parking lot, and crossed the road. I'd emailed the Roanoke Appalachian Trail Club for route planning help, and learned about a Boy Scout camp just up the trail from the parking lot. I wasn't sure if it would be signed, or easy to find, but luckily, signs and a kiosk at the trailhead in the parking lot showed the Boy Scout camp was only 0.2 miles up the trail. The North Mountain Trail is clearly not as well-used as the AT. We recommend plenty of water, long pants, and tick tweezers for this section! We made it to the camp, set up the tent, and my hiking partner walked back down to the parking lot to toss our trash in the bear proof can while I rinsed off in the creek and started dinner prep. I was dismayed to find broken glass all over the ground near our camp, and discarded wet wipes in both established fire pits, which were overflowing with ashes. I cleaned up as best I could, and when my partner got back, she shared something she learned after a close-up look at the map - we could tag Dragon's Tooth without packs on, and doing so only added 0.3 miles to our trip. When we woke to my 6am alarm, we discovered an issue that didn't require immediate attention, but did require an earlier, expedited return to my car than we'd planned. We discussed options, and decided we'd still hike to Dragon's Tooth to complete the Triple Crown. 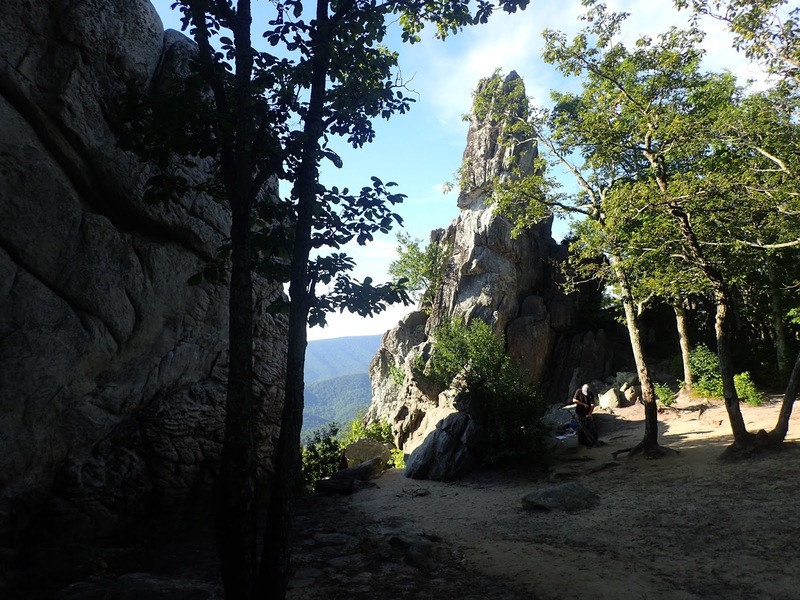 But when we got back to our packs, we'd see if we could find a ride four miles up Route 311 to the Mcafee Knob parking lot rather than hike the last six miles (3-4 hours) to complete the loop. Coming up on Dragon's Tooth. It's possible to climb up the feature using a trail to the right of this picture. Our ultralight hike up the Dragon's Tooth Trail felt incredible after carrying 35 pounds on all of our previous trail miles. I took a water bottle, my camera, my phone, and valuables - that was it. We made quick work of the first 1.3 miles of wide and clearly marked trail through lush, dense woods. 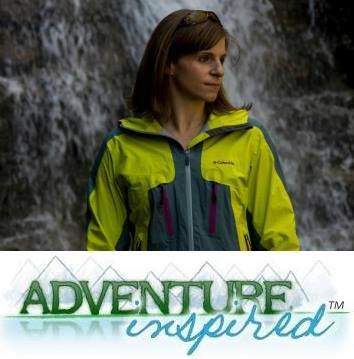 The last 0.7 miles were slower and required some hand-over hand climbing, traversing of steep rock ledges, and metal rungs. But man was the view at the top worth it. We spent some time at the top taking in the view, then headed back down, making the round trip in under three hours. After arriving back at camp, we took down the tent, packed up, and headed back to the parking lot hoping to find someone willing to drive us up the road to the Mcafee Knob parking lot. The first two ladies we asked said no, as they'd just arrived to start their day hike. The second group, a family who'd also just arrived, thankfully said yes, and after five minutes in the car along Route 311, we were back at my vehicle and on our way to Roanoke. Though we were short of the full loop, we did manage all three Triple Crown destinations over two nights, three days, and approximately 31 miles of hiking. To complete the loop, we'd have taken the yellow blazed connector trail at the Boy Scout camp to the AT, then followed the AT north for another 6.3 miles to the parking lot, a full 37 mile trip. After realizing I have enough tips, tricks, and route planning advice to make this report twice as long I've opted for a separate piece to help you plan your Triple Crown adventure. Click here to read more. Have you done the Triple Crown, or any of these destinations as day hikes? I'd love to hear from you! And a huge thanks to Virginia Tourism for sponsoring the trip. This article is extremely helpful! I am planning to follow in your footsteps next weekend and am wondering if there is bear-safe food storage at Boy Scout Camp. You noted appropriate trash cans in the lot, but it would be helpful to know if there are lockers adjacent to the campsite itself. So glad it's useful for you, Alex! We didn't find any lockers at the Boy Scout Camp, but we traveled with a bear canister. We saw others in the area hanging food bags from trees, but some were about 6" from the tree, which any bear wouldn't have trouble getting to. I'd advise a canister or a solid hanging food bag. Enjoy the trip, and let me know how it goes!